A Sexual Assault Nurse Examiner (SANE) is a Registered Nurse who has been specially trained to provide immediate, compassionate, and comprehensive care to sexual assault victims, including forensic collection of evidence. South Dakota, like much of the country, suffers from a lack of trained SANEs. The mission of the SANE Program is to coordinate the resources and provide support for healthcare professionals across the state in order to improve the access and delivery of services to all victims of sexual assault. Create and maintain a master list that tracks distribution and utilization of sexual assault examination kits in South Dakota. Maintain a state-wide roster of SANE-trained and SANE-certified healthcare professionals to ensure service capacity across rural SD counties. Provide support to healthcare professionals interested and willing to become SANE-trained or SANE-certified by holding quarterly workshops. Foster a peer-led SANE Learning Collaborative. Facilitate annual Clinical Skills Training. Establish and implement protocols for a toll-free help line for questions regarding usage of kits. Create and maintain virtual resource library. Identify, partner with, and support the existing networks of sexual assault response. Coordinate in-state clinical preceptorships and integrate graduating nursing students to the SD SANE Learning Collaborative. Why is the SANE Program important? We must ensure victims of sexual assault in our state have local access to a medical professional both trained and comfortable carrying out the forensic evidence exam with regard to the rights and emotions of the victim. Provide a compassionate and sensitive approach to sexual assault victims. Deliver timely medical/forensic examination with more complete evidence collection. Avoid further trauma to all sexual assault survivors in the health care environment. Maximize the probability of collecting and preserving the physical evidence of an assault for potential use in the legal system. Provide referral for follow-up care and counseling. The SANE listserve is intended for healthcare professionals interested in learning more about forensic nursing. Being a member of the listserve will allow you to ask questions, access on-line resources, and participate in the SANE Learning Collaborative meetings. 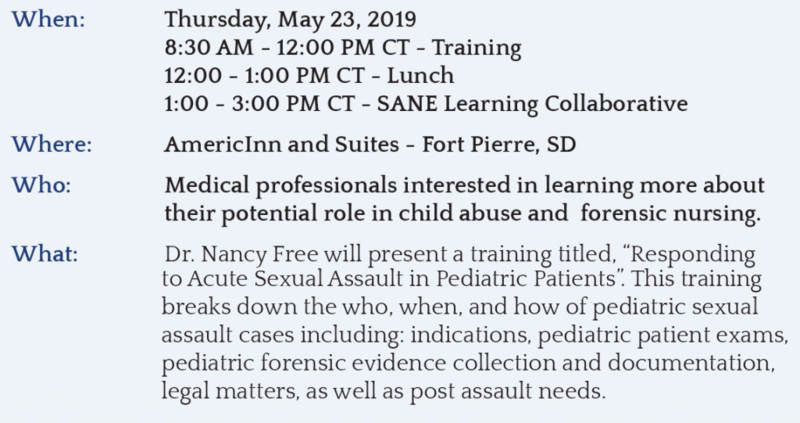 You will also be notified of the quarterly SANE-A or SANE-P training in our state. When is the next opportunity for SANE Training? The training is free of charge and attendees will be offered reimbursement including hotel, mileage, and per diem. This project is supported by Grant Number 2018-WR-AX-0014 awarded by the Office of Violence Against Women, U.S. Department of Justice. Its content is solely the responsibility of the authors and do not necessarily represent the official views of the U.S. Department of Justice.